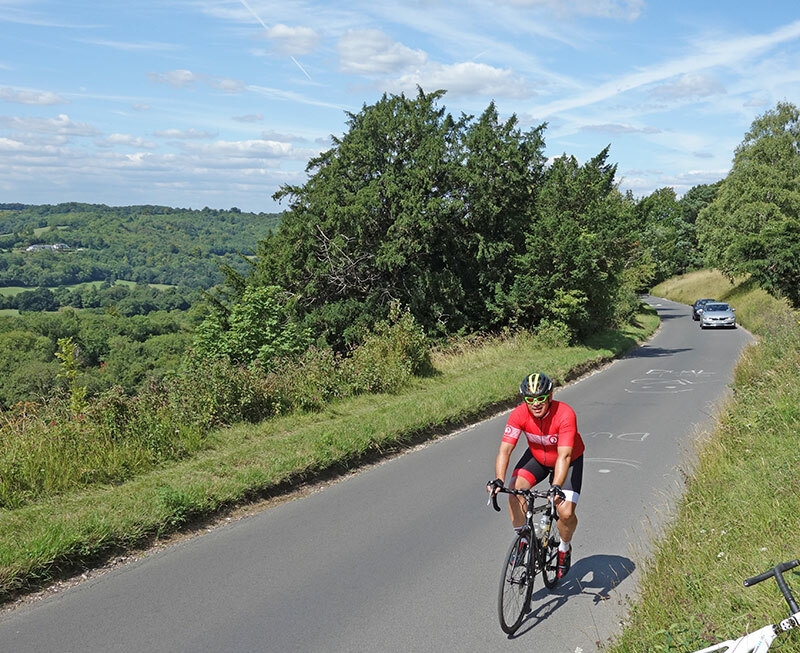 Box Hill is one of Britain’s most iconic climbs. The statistics don’t look particularly impressive – 2.5 km with an average gradient of 5%, for a mere 129m height gain. If Box hill was located in the foothills of the Pyrenees, it would barely mention a footnote. But, given it’s accessibility and closeness to London, it has become a popular test for every type of cyclist from the Olympic road race to beginner sportive riders. 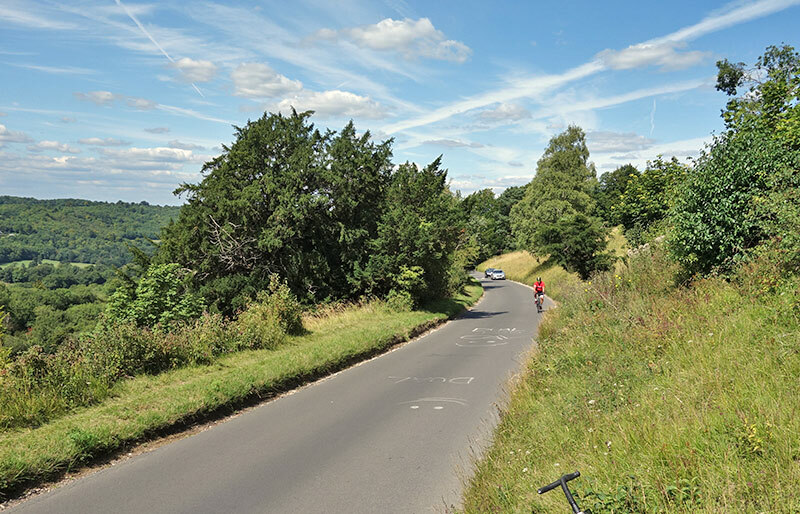 It is a challenging climb, but also manageable enough for just about everyone to ‘enjoy’ going up Box hill – even if you’re on a Brompton foldup. It also offers great views of the surrounding countryside. 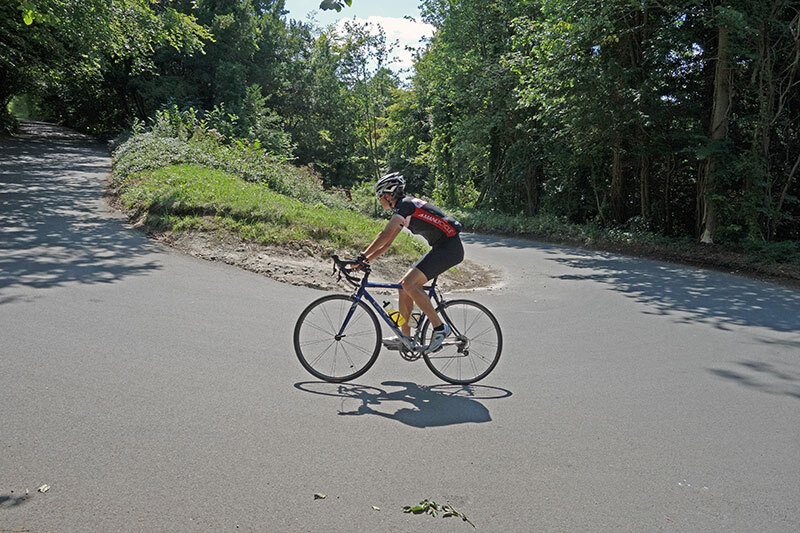 Box hill is also known as ‘Zig Zag’ hill for the couple of hairpins which really give it an Alpine feel – just for a short time whilst climbing Box Hill, you can imagine yourself away from London and cycling up a ‘proper’ climb. The Olympic road race was a once in a lifetime event, but fortunately it has left a lasting legacy. 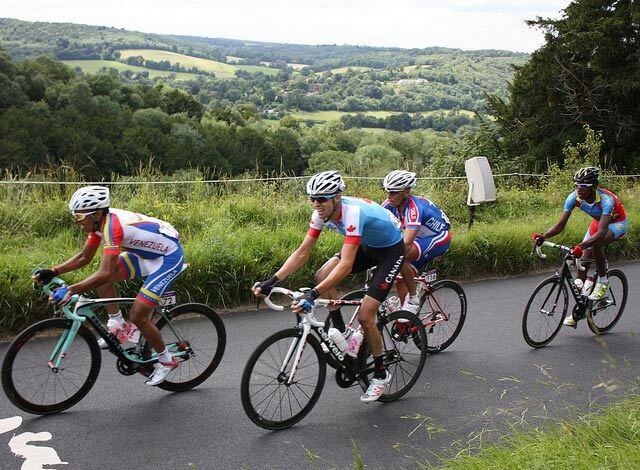 The Prudential London-Surrey Classic is becoming an important road race and it includes Box hill amongst other climbs. In 2014, Adam Blythe won a thrilling race. Also, the Olympics has made the climb even more popular, featuring in innumerable sportives and becoming one of the most popular Strava segments in Europe. 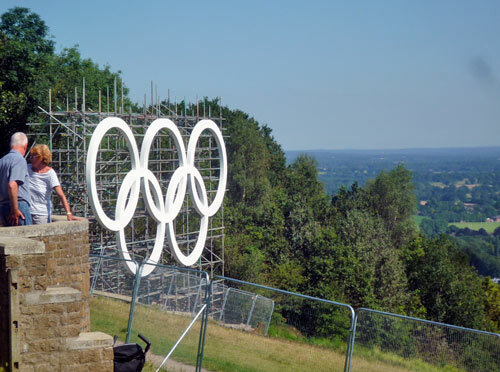 I visited Box Hill just before the Olympic road race in July 2012. 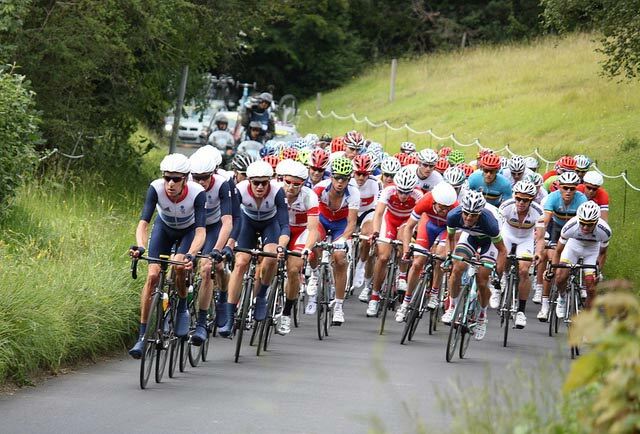 It was a couple of days before the Olympic road race and I thoroughly enjoyed going up Box Hill 9 times. I’ve never been back, even though it is tempting. Successful Everest of Box Hill: Roger Barr from Hampton and Ciaran O’Hara, August 2014 (74 ascents). 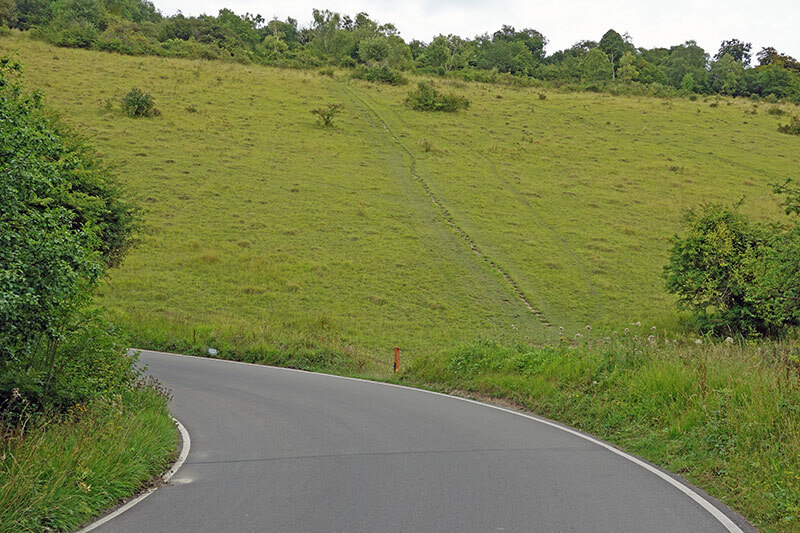 The full climb starts at the roundabout and takes the B2209 before turning right on to the Box hill road. Bradley Wiggins and Chris Froome lead Team GB up Box Hill. The Olympic road race was one of the few disappointments with the winner being Alexandre Vinokuorov, who had recently tested positive for performance enhancing drugs. 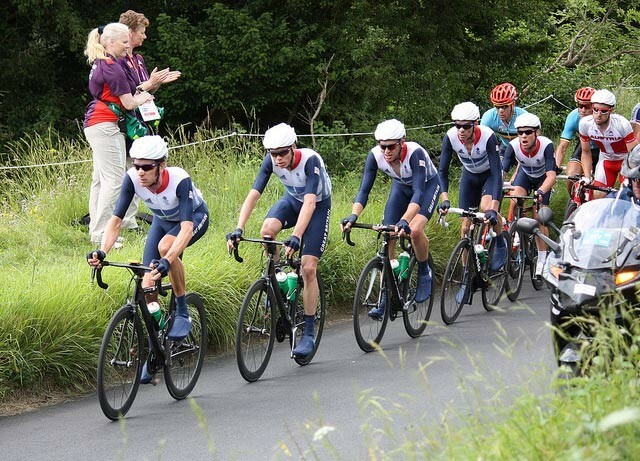 The British tactic of trying to manage the whole peleton with a team of five riders failed. Fortunately, in the women’s road race Lizzie Armitstead came 2nd and took Britain’s first medal. I went to watch the mens Olympic road race in London, a really memorable atmosphere and event. The streets were packed with spectators. The thing that struck me about the riders going through London was how slowly they seemed to be going. Still it was all over in fifteen seconds. 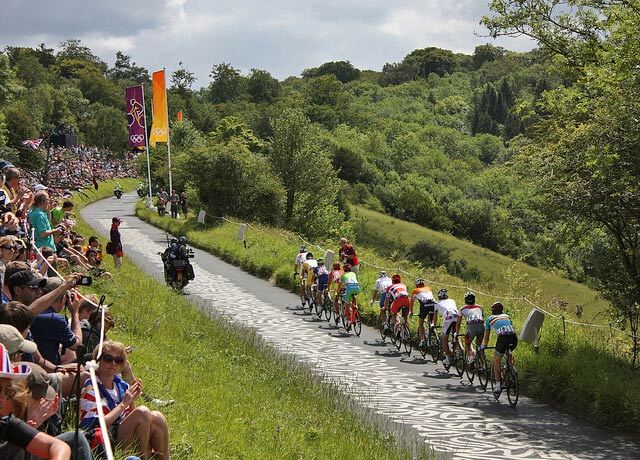 The mens and women’s Olympic road races will be both be using Box hill as part of the Olympic road circuit. The men will climb box hill (Ziz Zag road) nine times, the women two times. It is a good hill climb 2.5km, averaging 5%. It only climbs 125 metres, but after nine ascents it’s very testing. 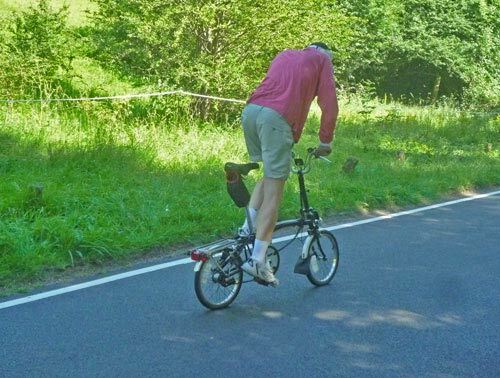 Box hill is also popular with a wide range of cyclists (I saw one guy powering his way up on a Brompton foldup). It’s constant gradient isn’t too severe and you can take it at your own pace. There is a nice cafe and great views at the top. The road climbs from: 54metres to 180 metres by the cafe at the top. After flattening out at the top, there are great views to the right. Around the corner, there is a secondary incline of another 10-15 metres. 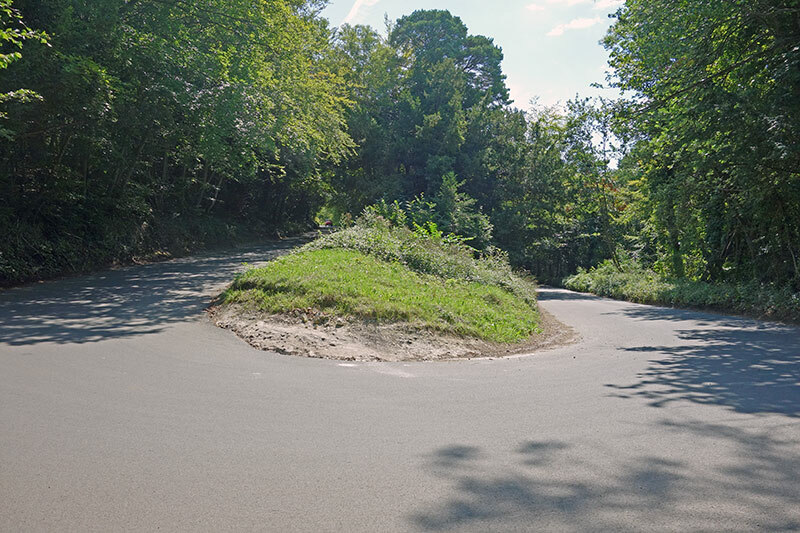 From the Olympic road race course, there is a sharp turn into the narrow road at the bottom of Box hill. In the road race, there will be a lot of competition to get a good position going into the climb, as the road is relatively narrow. The gradient is fairly constant at around 5-6%. I noticed a peak of around 7% on the lower slopes. After the first 180 hairpin, it slightly levels off but never less than 4%. The first hairpin is very sharp, there is a 180 degree switchback. After this the road comes out of the woods, and is quite exposed, especially if a strong headwind. Near the top, there is a final hairpin, though not quite as steep. As well as coming to take some photos and feel part of the Olympics, I also wanted to see how fast I could climb Box Hill. The fastest recorded time was 4.54 for the 2.5 km version – set during last years Surrey Cycle Classic (a warm up for the Olympics) average speed of 30.7Kph. You can’t take these comparisons too seriously. It’s very different doing hill intervals in training compared to participating in a proper 140 km road race. But, it still a bit of fun and interesting to see how quickly the peleton might climb the hill. I went down on Tuesday 24th July – the last day before the roads were closed for Olympic preparations. The weather was almost perfect. 30 degrees, a light head wind and sunny. Unfortunately, there was a lot of traffic on the climb with vans, lorries, cars and motorbikes all driving up – either to enjoy views or to set up for the race, which was already beginning in earnest. Quite a few ascents got disrupted by traffic jams. It felt like the whole world was descending on box hill. My first attempt at the 2.5 km segment was 4.48. The warm weather helped, I felt there was a headwind on the exposed section, though that might just have been psychological. At the bottom, I set off quite fast, touching 23mph. I went into the first hairpin with a lot of speed and almost ran out of road. It’s really quite sharp and it is hard to maintain all your momentum. On the more exposed section, it was a little harder, though the gradient eased a little towards the top. 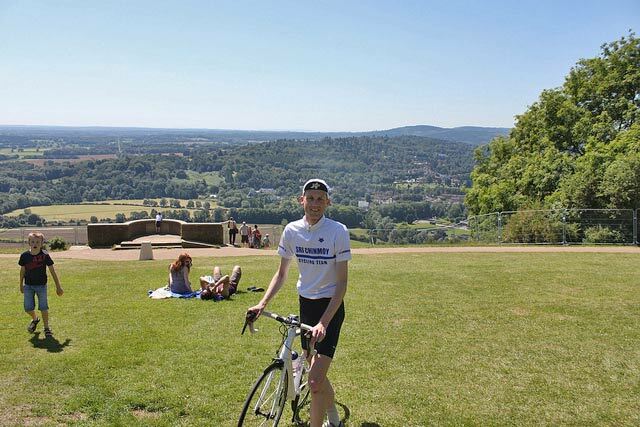 After finishing the climb, I did a couple of circuits of the Olympic road race and then thought it would be good to do nine ascents of box hill – like the men’s road race. I didn’t do the circuit but just went up and down. Despite the cars, it actually felt quite special to be training on the Olympic road race circuit. Box hill is a beautiful venue. If it was closed to cars and vans, it would be heaven for cyclists. It was interesting to see the Olympic set up, it really is a big organisation. It would be interesting to have Box Hill as the national hill climb championship one day, it would make a good course (though probably too flat for my liking), though I doubt the National Trust would want to close the roads for an event slightly less prestigious than the Olympics. On the route, I saw quite a few Olympic riders. A couple of New Zealanders, A Dutch rider, and a couple of US riders. I didn’t see any British / Team Sky riders. Knowing British Cycling’s attention to details, it’s hardly surprising they avoided Box hill and the inevitably traffic jams. I’m sure they will be testing the course tomorrow when the roads are closed to the public. It’s not often I travel to do training. But, this time it was really worth it. It’s not every year, the Olympics happens an hour from where you live. When I watch road race on TV, I’ll know what it’s like to do the climb. By the way, the ninth attempt was somewhat slower than the first! Despite the obvious difficulties and jams, cyclists and motorists seemed to get on OK, there was no tempers drawn. Both were reasonably considerate. It’s a real test. It’s such a great place to cycle, it’s unsurprising so many cyclists are on the roads around box hill. Definitely worth the cycling. The rest of the route could be described as rolling. A few ups and downs before a very fast section on a bit of dual carriageway. However, although it is dual carriageway, it’s not too bad as there is mostly a cycle path protected by white lines separating cycle path from road. 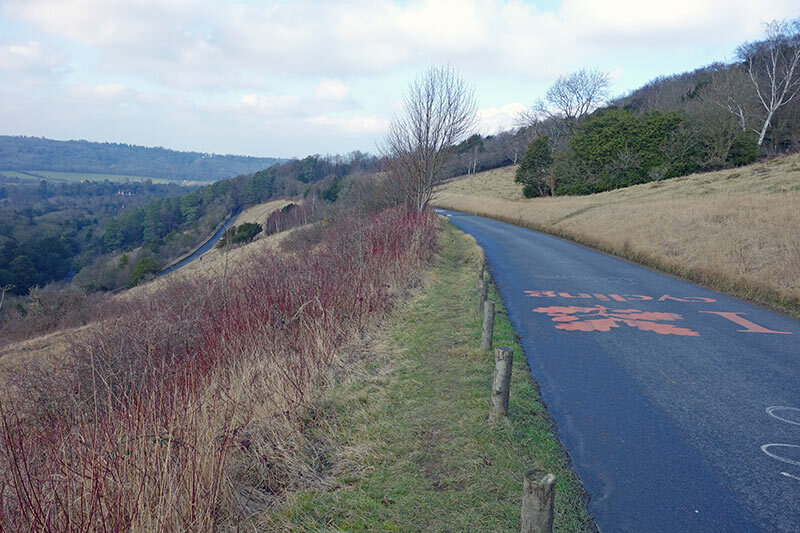 So what do you make of the mysterious JP’s Strava times on Box Hill (and on a few other big climbs)? They aren’t impossible (he’s just a few seconds ahead of you). But obviously there aren’t many people in the country capable of that, especially not solo! Whilst understanding the iconic nature and perspective, living in the north, it wouldn’t rank I’m afraid. ; and, a short hike from London there are some super climbs in Sussex and the South Downs. Do.most people flock there vecause of its nature or because of how it’s been marketed in recent times? Exploring the South Downs may be a wiser option and have less crowds.